Tipping can be a headache, knowing the correct amount to tip or not, can make our experience of dining, traveling etc. more comfortable. In most cases for services like porterage it should be half a euro to 1 euro. For an airport or railway porter, who is being paid a standard fee, additional .50 euro per bag is expected. For a porter in a hotel, 1 euro per bag is the standard. Others who expect a tip are lavatory attendants (.50), taxi drivers 10% and on shorter trips, round it to the next higher figure. For tour guides 1 euro or more if you find him good at his job. At a gas station, 1 euro or more if he also cleans the windshield. Zero at self-service pumps. In most Italian restaurants, ilcopertoand servizioincluso on the menu means one or two euros will be included for bread rolls, water, etc. and another 15% will be added to the final bill as a service tip. In such cases, there is no need to tip unless the experience has been outstanding. If the menu has servizio non incluso, then give 10% in cash to the waiter. Tipping in France is not compulsory if “service compris” is charged. This is usually 15%. In chic restaurants and cafes, generous tips are expected. For room service 1 to 1.5 euro and taxi drivers 10%. Tipping in Germany is not compulsory since the waiters and waitresses get a salary. But adding 3 to 5% is recommended. For other services, follow same rules as in Italy or France. Tipping in the Netherlands is not expected. VAT and service charges are included in bills. Public restroom attendants expect .5 to 1 euro and taxi driver about 10%. Tipping in Switzerland is not necessaryin restaurantsbut is customary to round off the final amount. Tipping in the United Kingdom is not necessary. Most hotels and restaurants include it in the bill and mention it. If it’s not included then it’s customary to tip 10 to 15%. 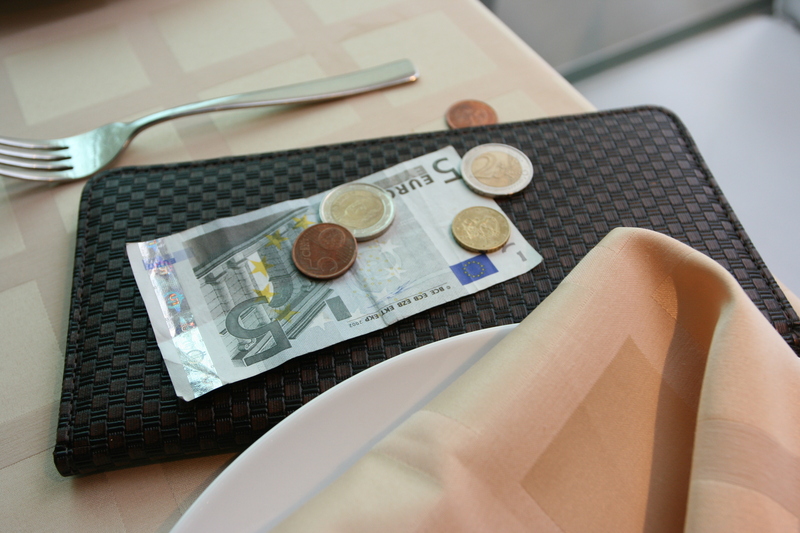 Tipping in Spain is a common practice although the final bill always includes the service charge. Add 5 to 10%. In self-service restaurants, fast food outlets and other such places, tips are not expected nor offered. Tipping is a custom that should be phased out; even though the charge is often included in the bill, the staff still expects 5 to 10% over and above, irrespective of quality of service provided. If the service is not up your expectation, express your disapproval politely. If you plan to travel this year, carry a multi-currency travel forex card and a small amount of the local currency for travel expenses. Foreign exchange for your travels can now be booked easily at the click of a button and delivered to your home. Simply swipe your forex cards when dining overseas and carry a small amount of cash for tipping at the local restaurants.